Summary - An NFL-centric micro site to build and share funny smack talk GIFs with your friends via Facebook or Twitter. What it is - With the Smack Talk Generator people can create personalized, animated GIFs of NFL stars talking smack to gloat after a big win or remind their buddies of how their fantasy game could use a little help. How it works - People go to the Smack Talk Generator landing page and start building a customized animated GIF to send to a friend via Facebook or Twitter. My role - Art direction, sketching, UI/UX, layout, GIF building, design, bug testing. 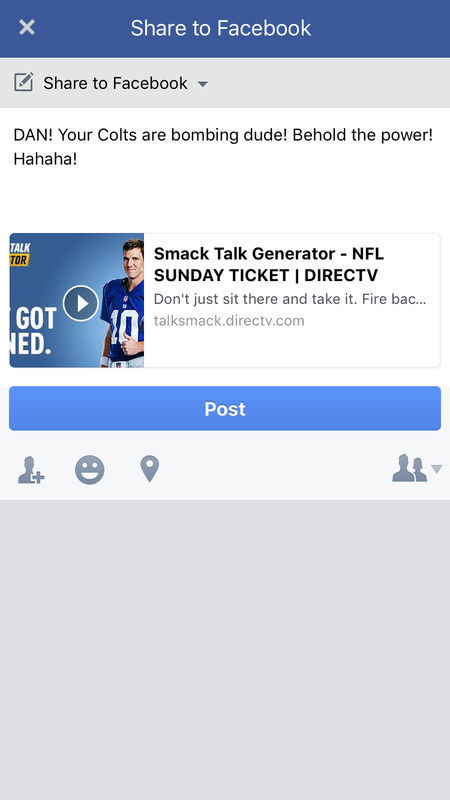 Summary - Banner ads promoting DirecTV’s NFL Sunday Ticket subscription product. What it is - DirecTV’s NFL Sunday Ticket subscription product is a package of channels that gives the DirecTV subscriber access to out-of-market games that would be unavailable through their local network affiliates. How it works - All clicks from these banners drive to the NFL Sunday Ticket homepage. Summary - Exploration of what an NFL Sunday Ticket Snapchat filter could look like for an Oakland Raiders fan. How it works - Snapchat user chooses their favorite team in Settings / Filters & Lenses / NFL Sunday Ticket. That team’s filter is displayed in the available filter options. User chooses the team’s filter. My role - Layout, design. Summary - Specs that were drawn up for responsive elements on the re-designed DirecTV website. What it is - During the DirecTV website re-design the dev team needed specs for some responsive page elements, in this case, modal headers. My role - Speccing responsive image, text and icon elements at all major break points. Communicating with dev team.